March 4, 2018 at the Iceplex in Winnipeg, Manitoba your SMA Flames captured the Gold Medal championship for the first time in our prep hockey team’s seven-plus year history and sixth in our own Female World Sport School Challenge. The gold medal was earned after a thrilling 2-1 Overtime winning goal against a very strong opponent in St. Paul, Minnesota’s Gentry Academy by grade 10 forward Danica Namaka. Gr 12 goaltender Logan Angers was stellar in goal to help preserve the historic win. After a tough 4-2 opening tourney game loss to Gentry on Thursday, March 1 at the Icepelx, the Flames peeled off three straight wins, two over longtime arch rival Thunder Bay Queens and the other over Minnesota Revolution on Friday the 2nd in the showcase game that saw a huge turnout of Flames supporters, the stage was set for a Gold Medal rematch with Gentry on Sunday. Pictured are Front row (l. to r.) Julianna Thomson, Kaitlyn Chatyrbok, Danica Namaka, Kate Gregoire, Ashley McFadden, Sarah Dennehy, Logan Angers and Hailey Karbonik. Back row l. to r.: Jason Panteluk (Associate Coach), Sydney Cancilla (inj. 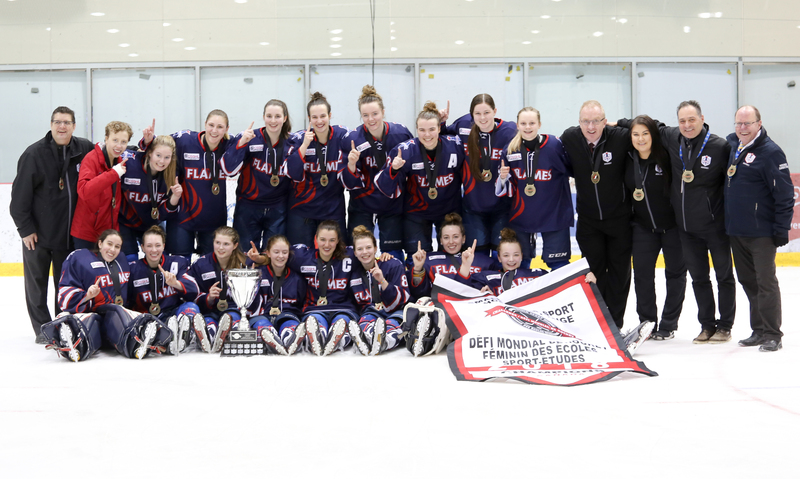 ), Seren Jocelyn, Ashleigh Jeannotte, Kate Bumstead, Lainie Nichols, Gabi Dawyduk, Lexi Cheveldayoff, Kennedy Frank, Chloe Oleksiuk, Larry Bumstead (Head Coach), Alyssa Ross (trainer), Robert Friesen (Assistant Coach), Mr. Dave Chell (Teacher Co-Manager/Scouting Liaison). Missing: Aimee Patrick (inj. ), Rejean Beauchemin (Goalie Coach), Ms. Alyssa Nabess (Teacher/Co-Manager). Flames Co-Manager, Dave Chell, submitted an article covering the second annual ‘Flames in the Kitchen’ event to the CSSHL newsletter. 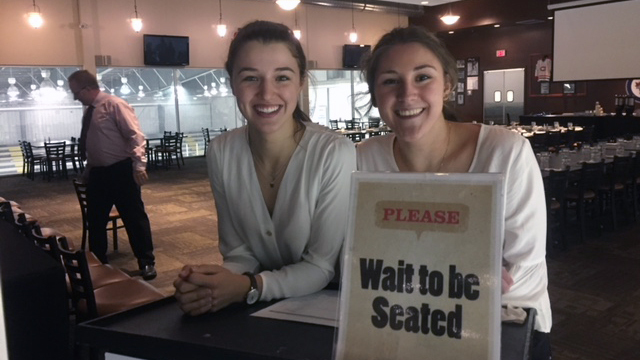 This event helps create ‘a healthy balance between athletics and life lessons off the ice’ for the players who all played a part; from running the kitchen to busing tables. 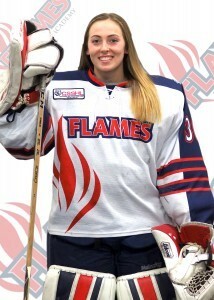 Congratulations to our own SMA grade 12 goalie Logan Angers, who made the team. The player selections were made by Melody Davidson, Hockey Canada’s general manager of national women’s team programs, alongside the team’s coaching staff. Congratulations to SMA Flames Hailey Karbonik, Lexi Cheveldayoff, Ashley McFadden, Kaitlyn Chatyrbok, Logan Angers, Sarah Dennehy and Kate Gregoire on their selections to the 2017 Team Manitoba roster for the upcoming U18 Women’s National Championship. This year’s tournament will take place from November 1 – 5 in Quebec City, Quebec and includes eight (8) provincial and regional teams, including Alberta, Atlantic, British Columbia, Manitoba, Ontario Blue, Ontario Red, Quebec and Saskatchewan. The Flames are extremely proud to announce that Team Manitoba has just named your own Flames captain Ashley McFadden as its team captain, and Alexi Cheveldayoff and Sarah Dennehy as two of the team’s three assistant captains! This is by far and away the most dominant leadership group to come from one single school or team in our seven years of existence playing in AAA/prep hockey and supplying players to this team to represent our province! Hockey Manitoba is proud to announce the roster for the 2017 Female U-16 Team Manitoba. After very successful inaugural Spring, Top-40 & Summer Development camps, the Female U16 Team Manitoba Roster includes 11 players from the rural AAA programs as well as 9 players from the various Winnipeg AA teams and Sport Schools. 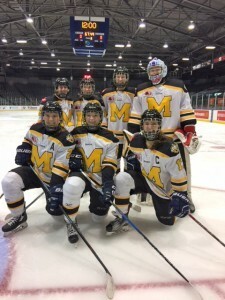 The Female U-16 Team Manitoba will compete at the Central Plains Midget AAA Tournament held in Portage la Prairie, MB from September 22-24, 2017 to wrap up the first year of Female U-16 Program of Excellence. The Flames are proud to announce that five players on our 2017-18 roster made this team. They are second year grade 10 veterans, forward Danica Namaka and blue liner Kate Bumstead, as well as incoming grade 10 forwards Aimee Patrick and Chloe Oleksiuk as well as grade 10 blue liner Lainie Nichols. 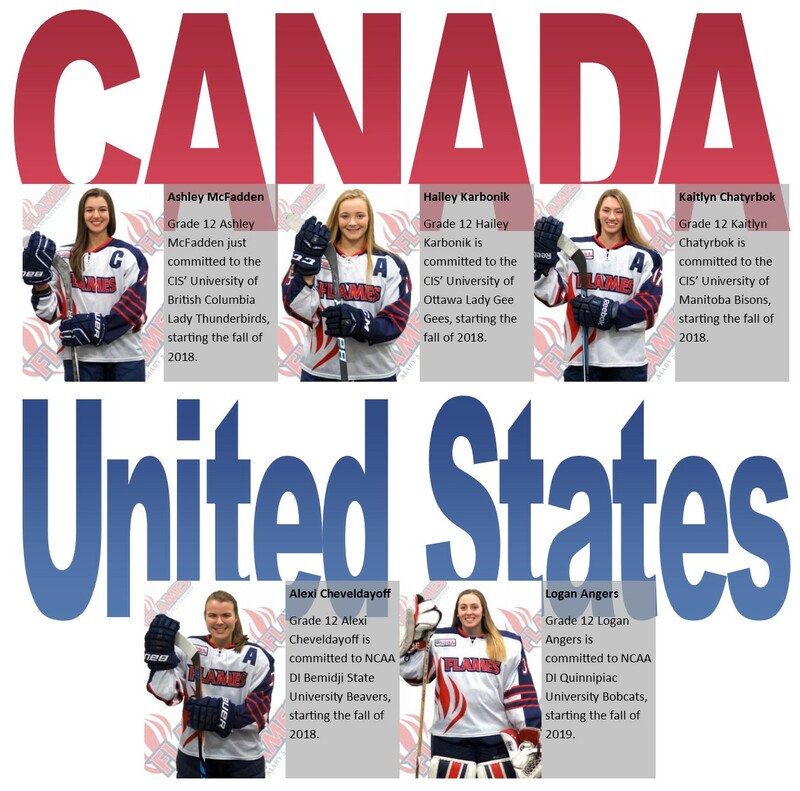 Congratulations, ladies, way to hold high the torch! The 2017-18 edition of the SMA Flames prep hockey team enjoyed a balmy Friday September 8 evening out at Amaze in Corn off south St. Mary’s road for a team bonding event. 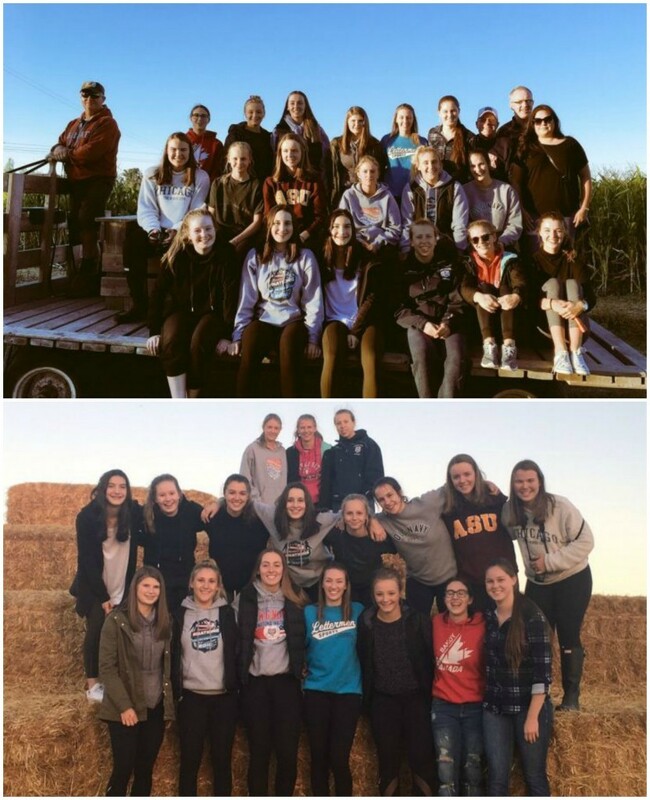 Coach Bummer, Mr. Chell and trainer Alyssa joined the 18 players and a fun, and at one point scary, time was had by all as several clowns and masked-adorned characters made appearances as the sun set and the players worked their way through the corn maze!